ABSTRACT:Two simple, precise and accurate methods were developed and validated for the Simultaneous estimation of Hydrocortisone acetate and Sulphacetamide sodium in the combined dosage forms. The first method involves the usage of Simultaneous equation for the determination and the second method employed is the Multicomponent mode. For both the methods the wavelengths selected were 241.5nm and 271.0nm which are the absorbance maxima of Hydrocortisone acetate and Sulphacetamide sodium respectively. The drugs obeyed Beer’s law in the concentration range of 5-50µg/mL for hydrocortisone acetate and 5-40 µg/mL for Sulphacetamide sodium. The results of the analysis were validated statistically and by recovery studies. INTRODUCTION: Hydrocortisone acetate (HC) is chemically 11, 17-Dihydroxy-3, 20-dioxopregn-4-en-21-yl acetate (Fig. 1). This is a short acting corticosteroid that inhibits or suppresses most of the inflammatory and the immune responses which are of bacterial, traumatic or anaphylactic action. Corticosteroids act by inducing lipocortins which are the inhibitors of proteins phospholipase A2, the proteins that control the biosynthesis of inflammatory mediators such as prostaglandins and leukotrienes which cause inflammation. Hydrocortisone acetate is usually used as a short term medication to treat inflammation in eyes. Literature review revealed that many methods were developed for the determination of hydrocortisone acetate by HPLC 1-2 and spectrophotometric methods 3-4. Sulphacetamide sodium (SP) is a sulfonamide antibiotic which is chemically sodium salt of N-acetyl sulphanilamide (Fig. 2). Sulfonamides inhibit the bacterial multiplication by acting as the competitive inhibitors of Para amino benzoic acid in folic acid metabolism. This is topically used for ocular infections. Various analytical methods are reported for the estimation of Sulphacetamide sodium in pharmaceutical formulations 5-7. These two drugs are employed as a combined dosage form to treat the inflammation of eyes associated with infection. The marketed formulation of the combined dosage form of these drugs is an ophthalmic preparation available as Cortola-M. Literature studies revealed that there is no method till date developed for the estimation of these two drugs in the combined dosage form and hence a simple, precise and an accurate UV-Spectrophotometric method has been developed in the present study. Apparatus and Reagents: Spectral runs were made on a Shimadzu UV-Visible Spectrophotometer, model- 1800 (Japan) employed with spectral bandwidth of 0.5 nm and wavelength accuracy of ± 0.3 nm with automatic wavelength corrections with a pair of 10 mm quartz cells. Glass wares used in each procedure were soaked overnight in a mixture of chromic acid and sulphuric acid and were rinsed thoroughly with double distilled water and dried in hot air oven. Reference standard-Hydrocortisone acetate and Sulphacetamide sodium were purchased from Yarrow chem products, Mumbai, India. The reagents used are all of analytical grade. The prepared solutions were protected from light and analyzed on the same day. Pharmaceutical Preparation: The commercial pharmaceutical preparation of the combination is Cortola-M. The content includes Hydrocortisone acetate 1%w/v and Sulphacetamide sodium 10%w/v. Selection of Common Solvent: The selection of solvent is made after assessing the solubility of both the drugs in various solvents. Ethanol is selected as the common solvent and the spectral characteristics were studied out using this solvent. Preparation of Standard Drug Solution: Standard stock solutions containing Hydrocortisone acetate and Sulphacetamide sodium were prepared individually by dissolving 25 mg of HC and SP separately in 15 ml of ethanol. It was then sonicated for 10 minutes and the final volume of both the solutions were made up to 25 ml with ethanol to get stock solutions containing 1mg/mL each of HC and SP in two different 25 ml volumetric flasks. Preparation of Sample Solution: 0.5mL of the marketed formulation equivalent to 50mg of SP was taken into a 10mL volumetric flask and dissolved in ethanol and volume was made up to the mark with ethanol. The solution was then filtered. This solution is then suitably diluted with ethanol to obtain the solutions containing HC and SP in the ratio 1:10 respectively as in the formulation. 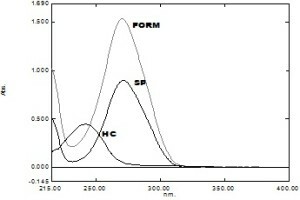 Determination of Absorption Maxima: By appropriate dilution of two standard drug solutions with ethanol, solutions containing 10 µg/mL of HC and 10 µg/mL of SP were scanned separately in the range of 200- 400 nm to determine the wavelength of maximum absorption for both the drugs. HC and SP showed absorbance maxima at 241.5 nm (λ1) and 271 nm (λ2) respectively (Fig. 3). Method I (Simultaneous Equation Method): Two wavelengths selected for the method are 241.5 nm and 271 nm that are absorption maxima of HC and SP respectively in Ethanol. The stock solutions of both the drugs were further diluted separately with ethanol to get a series of standard solutions of 5-50 µg/mL concentrations. Where, A1 and A2 are absorbance’s of mixture at 241.5nm and 271 nm respectively, ax1 and ax2 are absorptivities of HC at λ1 and λ2 respectively and ay1 and ay2 are absorptivities of SP at λ1 and λ2 respectively. Cx and Cy are concentrations of HC and SP respectively. Method II (Multicomponent Mode): Multicomponent mode was employed for the estimation of these drugs in the combined dosage form. For this method of analysis 241.5nm and 271nm were selected as the sampling wavelengths. The drugs showed linearity in the range of 5-50µg/mL for HC and 5-40µg/mL for SP. Three mixed standard solutions containing both the drugs were prepared in the ratio of 1:10 and the spectral characteristics were studied after the data is fed into the instrument. The instrument then gave the concentrations of individual drugs in the test by an inbuilt microprocessor. Method Validation: The method was validated according to ICH Q2B guidelines 8 for linearity, accuracy and precision. Linearity: Linearity solutions for the method were prepared from the stock solutions of both the drugs and spectral runs were carried out. Precision: This is studied to find out the intra and the inter day variations in the developed method. The %RSD of the three assay values at three different concentrations on same day (intraday) and on three different days (interday) values were calculated. Accuracy: The accuracy of this method was evaluated at three concentration levels and the recovery studies were performed by standard addition method. Percent recovery for both the methods was then calculated. RESULTS AND DISCUSSION: The overlain spectra of Hydrocortisone acetate and Sulphacetamide sodium exhibit λmax of 241.5nm and 271nm respectively. These wavelengths were selected for both the methods. Standard calibration curves for the drugs were described with equations y=0.046x + 0.001 for HC and y=0.063x for SP for simultaneous equation method and y=0.046x+0.003 and y=0.062x+0.008 for HC and SP respectively for Multicomponent mode. The correlation coefficient for both the drugs was found to be 0.999 in both the methods. The beer Lambert’s linearity range of these drugs include 5-50µg/mL for HC and 5-40µg/mL of SP. The results were tabulated in table 1 and 2. The %RSD for the intraday was found to be 0.945 for HC and 0.529 for SP. Similarly 0.70 and 1.49 are the %RSD of HC and SP respectively for interday studies for simultaneous equation method.In the case of Multicomponent mode the %RSD for intraday was found to be 0.33 for both the drugs and %RSD for interday studies were found to be 0.82 and 0.76 for HC and SP respectively. The %RSD for intraday and interday precision were found to be less than 2 indicating that the method is precise. The results of these were presented in table 3. The accuracy was confirmed by the recovery studies and the percentage recovery was found to be in the range of 96-102% thus justifying the method. From accuracy studies it was found that the RSD was less than 2% indicating that the method is accurate. The results were presented in table 4. CONCLUSION: As there is no single UV-Spectrophotometric method developed till date for the estimation of Hydrocortisone acetate and Sulphacetamide sodium in the combined dosage forms these two simple, precise and accurate methods have been developed. Thus these methods can be employed for the routine estimation of HC and SP in bulk as well as in the formulation in a shorter period. ACKNOWLEDGMENTS: The authors are thankful to GITAM Institute of Pharmacy, GITAM University, Rushikonda for providing the research facilities. Janicic Stojanovic B, Malenovic A, Markovic S, Ivanovic D, Medenica M: Optimization and validation of an RP-HPLC method for analysis of hydrocortisone acetate and lidocaine in suppositories. Journal of AOAC International 2010; 93(1):102. Amir. H.M. Sarrafi, Manochehr Bahmaei, Assieh. Z. Mousavi: Simultaneous spectrophotometric determination of lidocaine and hydrocortisone acetate in pharmaceutical preparations by multivariate calibration methods. 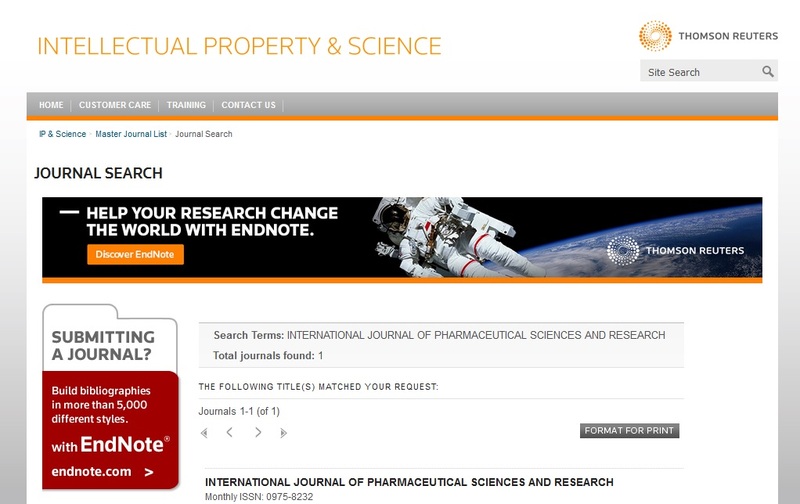 Journal of the Iranian Chemical Research 2010; 3: 31-36.R. Hajkova, P.Solicha, J. Dvorak, J. Sicha: Simultaneous determination of methylparaben, propylparaben, hydrocortisone acetate and its degradation products in a topical cream by RP-HPLC. Journal of Pharmaceutical and Biomedical Analysis 2003; 32:921-927. Blanco M, CoelloJ, Iturriaga H, Maspoch S,Villegas N: Kinetic spectrophotometric determination of hydrocortisone acetate in a pharmaceutical preparation by use of partial least- squares regression. The Analyst 1999; 124(6):911-915. KC. Chaluvaraju, K.Ishwar Bhat, Zaranappa: Quantitative spectrophotometric determination of sulphacetamide sodium in bulk and in pharmaceutical dosage form. Journal of Pharmacy Research 2010; 3(1): 47-48. GR Rao,S SN Murty, PJ Rao, I RK Raju, Rao G Rama, Rao jagannadha: Spectrophotometric determination of sulphacetamide sodium with o-chloranil in dosage forms. Indian Journal of Pharmaceutical Sciences 1988; 50(2):138-140. Gaur Ajay, Gupta R, Shrivastava B: Colorimetric estimation of sulphacetamide sodium in bulk and in formulations. Indian journal of Pharmaceutical Sciences 2007; 69(3):464-467. 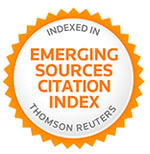 ICH Validation of analytical procedures: text and methodology Q2 (R1), International Conference on Harmonization, 2005. Harika M and Kumar GS: Simultaneous UV-Spectrophotometric estimation of Hydrocortisone acetate and Sulphacetamide sodium in Combined Dosage Form. Int J Pharm Sci Res 2013; 4(5); 1901-1904.